When I visited Tineke van Brederode this week, she gave me some nice presents. A box with 10 Emtec vinyl look CDr’s, an address of a graphic designer who looked for a hand letterer, and a CD of the Bob Brozman Orchestra. 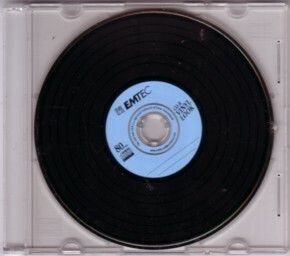 A track of this CD was on the CD that comes with the second issue of Beyond magazine, which is made and published by Tineke’s husband Erk Willemsen. I had written a letter about that CD in which I said that I liked the Bob Bozman Orchestra track very much. So now I have the whole CD, Lumiere , and I like that too. Beautiful and inspired music, everything composed and played by Bob Brozman himself. I have not written about one man bands yet, but this is a high interest of mine. 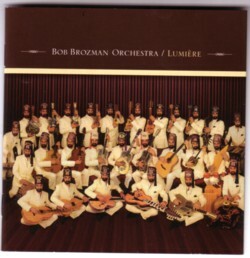 Although the Bob Brozman Orchestra is not a One-man-band as I define it, where all the instruments are played by one person at the same time, it is a one man band. Even an orchestra! Most one man bands in my collection are paying rock’n’roll, but Bob Brozman plays music that echoes tunes from all corners of the world. In the CD booklet he mentions Ravel’s Bolero as his earliest musical memory, and the early blues as two of his major influences. I also hear Hawaiian exotica records and Gypsy music. But I am no music journalist, you can check out the man and his music himself by Googling or clicking here. I grew up with music that was made for the charts. There is nothing wrong with that, but nowadays I prefer artists who do their own thing, no matter whether it is commercially successful or not. The charts, and the whole industry built around the 1% of the music that ever reaches a chart, represents only a very small part of the musical landscape, and definitely not the most interesting part. The chance that Bob Brozman will ever have a hit is small, but I am sure that some of the readers of blogs like this will like his CD. Here is Ska waltz train , one of the more poppy tracks of the CD.